I’ll Take “Book Hunting” For 100! Unless I’ve miscounted or my blog program is lying to me, this should be my 100th post here at the Old Book Junkie. 100. Didn’t know if I’d make it that long. Thanks to all of you who have read and/or followed me here. I can’t tell you how much I appreciate all your “likes” and comments. Hopefully, I can earn your continued patronage in the year ahead. Now, onward. Once again I have been out among the thrift stores and library sales, and once again I have found some nice books. This past Friday my wife and I were at the Disabled American Veterans Thrift store, one of our favorite places to rummage around in. They have great items at great prices and for a great cause. For example, I found a nice copy of “Egermeier’s Bible Story Book: A Complete Narration from Genesis to Revelation for Young and Old,” (1955, Warner Press Publication, Gospel Trumpet Company.) 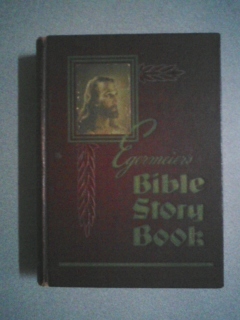 These versions of the biblical stories were first written and published in 1923 by Elsie E. Egermeier. The 1955 version I found was revised slightly by Arlene Hall. Elsie Egermeier’s intent was to “present these stories in such a simple, direct manner that her youthful readers will have no difficulty in comprehending their teaching.” It seems that this type of book, re-telling the key Bible stories in plain language for younger readers, was very popular in the early to mid-20th century. Some of the newer ones I’ve seen today tend to be cartoonish in their approach, particularly the illustrations. 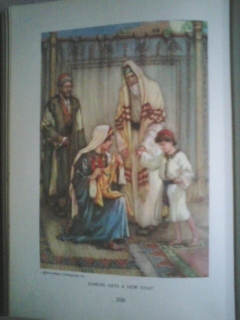 As you can see from this picture, that’s not the case with “The Bible Story Book.” The book is full of wonderful color and black and white lithographs that don’t turn the stories into fairy tales. I have concerns about children seeing cartoon depictions of Moses or Jesus. Do they understand that they were real people and not some cartoon characters? reproach from the people of Israel. Whether you think the Apocrypha should be canonical or not, it is a marvelous enhancement to the Scriptures. I’ve always enjoyed reading it, particularly the Wisdom of Solomon and Tobit. This annotated copy of the Revised Standard Version is a great addition to my library. Finally, I found a copy of the “Abingdon Bible Handbook,” (1975, Abingdon Press) by Edward P. Blair. This will be a useful reference book since it includes nice, brief summaries and backgrounds on each book of the Bible, as well as chapters on Bible translation, interpretation, history, archaeology and chronology. Well, that’s all for now. Thanks again for hanging with me and I hope to have a lot more interesting things for all of you in the year ahead! Spring,Summer,Fall. Birth, life and death. It’s the “Circle of Life” and it’s been glorified in children’s movies and other places over the years. But a circle is a closed figure, with no beginning and no end and if you’re inside the circle you are basically in a prison. In Thomas Cahill’s book, “The Gifts of the Jews: How a Tribe of Desert Nomads Changed the Way Everyone Thinks and Feels,” ( Nan A. Talese/ Doubleday, 1998) he shows us how the Western mind escaped from this prison. The primeval human’s religion and worldview were so different from what we experience today that it’s very difficult for us to imagine how they saw their lives and world. The great wheel of life and death was truly a grinding wheel. There was no past, present or future as we view it, only an endless cycle. Every event has happened, is happening now and will happen again. Further, there was no sense of the individual for humans at that time. There was only the “world of groups, tribes, and nations, in which all identity and validation comes only from solidarity with a larger entity.” There were no dreams of a better life for you or your family, only the class or archetypal group you were born into. To the modern mind this is nearly incomprehensible. Haven’t humans always seen the world the way we see it? How could it be viewed any other way? But what is even more amazing is how our modern worldview came into being out of the mind-numbing repetition and the soul-nullifying class systems of the ancient world. According to Cahill, we can thank the Jews for our escape. After a short course on the ancient Sumerian civilization, Cahill dives into the Old Testament to show us what these “gifts” are and how they came about. In particular, he focuses on the stories of Abraham, Moses and David. I won’t try to detail all the gifts he brings to light, but I will highlight the ones that he emphasizes. It begins with Abraham, whose life would have been just fine had he remained within the circle of life and his own family group. But he hears the voice of God, promising him “something new, something better, something yet to happen, something – in the future.” Not only will Abraham become a father in his old age, but God will make of him a great nation. All he has to do is “go forth” into the unknown. So he does, right out of cyclical time and into linear time. Time now contains past, present and future and we now have the idea of history. With Moses came new gifts, one of which changes religion forever. Ancient religions were not about spirituality. Far from it. Cahill describes them as “impersonal manipulation by means of ritual prescriptions.” Christian author Eugene Peterson characterizes these rituals as “impersonal, nonrelational, acquisitive religious technologies.” It was all about using the gods to get what you wanted. The gods really didn’t care that much about man, but they controlled things that man wanted, things like rain to ensure good crops, fertility for large families and plentiful herds, strength and good fortune for war and the blessings of good health. Man initiated his rituals to obtain these things. But the God of Abraham and Moses is different. He is the One who initiates contact with man. In Moses’ case, God grabbed his attention via a burning bush that wasn’t consumed. When Moses turns aside to see this wonder, God begins speaking to him. Suddenly, religion isn’t only about manipulation anymore. God has initiated a relationship with man and He and Moses enter into an actual conversation. 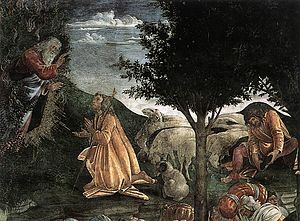 The Holy one invites Moses to take off his shoes and tells Moses His name. Then comes the part Moses wants nothing to do with: God has a job for him. He is to go back into Egypt and lead the people of Israel out of slavery. This endeavor leads to a close, personal relationship between God and man, an amazing and somewhat terrifying gift. It also leads to another gift, one of the greatest of all, the concept of liberation and freedom. And they are the gifts of God. So I stopped by my local library today and checked in the children’s section. They have a box by the children’s librarian’s door with free books and magazines they will eventually throw-away if no one grabs them. I’m all for giving unwanted children’s books a home! 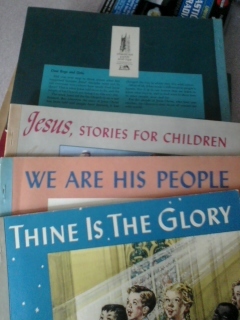 Today I found 11 short paperback books published by The Westminster Press as part of their “Christian Faith and Life” series which is billed as a “program for church and home.” All of them appear to be from the 1950s and 60s and are illustrated in that classic 60s style art. I’m guessing the books are aimed at children in the 8 to 12 year-old age range. On top of everything else, they’re all in very good condition! I have to say, after a brief skimming of a few of them, the theological concepts I found are clear and very well presented for children. Today’s churches could use these books! I’ll try to share more of the contents with you as I have the chance to go through them. Writing in the aftermath of World War II, Christopher Dawson took exception to the suggestion that modern European civilization was “pagan.” Paganism was rife with religious sentiment, Dawson recalled; what was going on in mid-twentieth century Europe was something different. True, many men and women had ceased to belong to the Church. But rather than belonging to something else, rather than adhering to another community of transcendent allegiance, they now belonged nowhere. This spiritual no-man’s-land, as Dawson characterized it, was inherently unstable and ultimately self-destructive. Or, as the usually gentle Dawson put it in an especially fierce passage, “a secular society that has no end beyond its own satisfaction is a monstrosity – a cancerous growth which will ultimately destroy itself.” One wonders what Christopher Dawson would say today. I’ve been having pretty good luck with the book hunting lately, but I was exceptionally fortunate this past Saturday at my local library’s ongoing book sale. 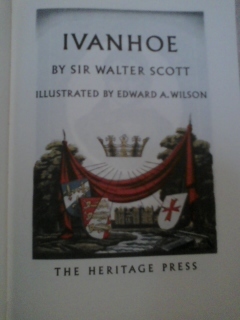 I found a beautiful copy, in excellent condition, of “Ivanhoe,” by Sir Walter Scott. This hardbound edition put out by the The Heritage Club (The Heritage Press, 1950) includes the original slipcase and a copy of the Heritage Club newsletter, “Sandglass,” which goes over some of the more interesting historical notes about the novel. Also interesting is the fact that Scott raised some eyebrows by including Jews as prominent characters in his novel, which at that time was considered “startling, exotic.” The character of Rebecca was based on a real Jewish American Tory named Rebecca Franks who lived in Philadelphia during the Revolution. Being a Tory, after the rebels won America’s independence, Rebecca and her family were evacuated to England where she eventually met Scott. The rest, as they say. The Wall Street Journal had an excellent Books section this past weekend. I was particularly interested in two reviews. Something that all too many people today seem to have forgotten. The other review of interest was about Jonathan Sacks’ new book, “The Great Partnership: Science, Religion and the Search for Meaning,” (Schocken, 370 pages, $28.95). Sacks, the chief rabbi of the Untied Kingdom, has a go at the currently flaring battle between science and religion. I find this topic fascinating, though I expect neither side will win a final victory. I know where I stand, and I’m sure that Richard Dawkins knows where he stands, but I don’t see either of us changing our minds any time soon. But it is fun to watch the volleys each side lofts at the other. Ah, the bombs bursting in air! Finally, I received the advance copy of “The Core of Johnny Appleseed” a few days back. This is the book I wrote the Foreword to. It’s beautiful, if I say so myself. It’s scheduled to be released on November 1st. Here’s the link to the Amazon listing for those who are interested. Thanks and have a great week all! 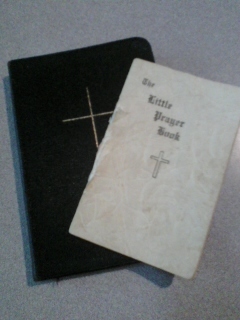 I like prayer books. I have at least a dozen of them, probably more. I have Anglican, Roman Catholic, Lutheran, Jewish and even a Billy Graham, Evangelical prayer-book. Yes, there is an Evangelical prayer-book, though it’s not a standardized one intended for corporate worship. My wife and I attend an Anglican church that uses the 1928 Book of Common Prayer. It is designed for both liturgical and personal use, as are the Roman Catholic, Jewish and Lutheran ones. Not all prayer books are meant for liturgical use. I have several that are designed for personal devotion and meditation, and some that are simply collections of prayers through the ages. Of course, I have many books that are ABOUT prayer, including Richard J. Foster’s “Prayer.” I’ve lost count of how many of those I own. I’ve always felt that prayers were a type of poetry. Some of the most beautiful words I’ve read were arranged in prayer to God. Offerings, if you will. In reading these various prayers, I often find myself actually praying, which is a good thing! There are some, I know, who are skeptical of using prayers that are written out and arranged for corporate or personal use. These prayers may seem to be mechanical or “canned.” However, if read with a real awareness of the words, these prayers are actually teachers which can lead us into deeper communication with God. They can widen the areas we speak to God about and help us to become better pray-ers. I will share some of these prayer-books with you in future posts. I find as I get older, I enjoy history more and more. I don’t know if that’s the age-wisdom thing kicking-in or if it’s just because I’m getting close to being history myself. Whatever the case, I can see more clearly the importance of understanding history in today’s world. 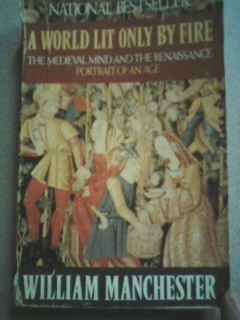 I recently finished reading William Manchester‘s “A World Lit Only by Fire: The Medieval Mind and the Renaissance; Portrait of an Age,” (Back Bay Books, Little, Brown and Company, 1993). I’ve referenced it in previous posts, one on Robin Hood in particular. I believe I wrote at one point that I wasn’t sure I was going to attempt a review of this book because of the sheer density of information and illustration that Manchester packs into it. William Manchester was a renaissance man in his own way. His medium was words. He was journalist, a biographer, an essayist, an historian and a novelist. He is probably best remembered for his book, “The Death of a President: November 20 – November 25, 1963,” in which he recounts and analyzes the assassination of President John F. Kennedy. Manchester’s writing is straightforward, but with a clarity and immediacy which puts the reader into whatever situation he describes. This talent serves him well in the telling of history. “A World Lit Only by Fire” is divided into three sections, or essays, rather than chapters. The first and shortest concerns The Medieval Mind, the second and longest recounts The Shattering, and the final essay, One Man Alone, is his vivid telling of Magellan’s circumnavigation of the globe. Try to imagine living in this world, people. The collapse of the Roman Empire had plunged Europe into darkness indeed. It was a time of “incessant warfare, corruption, lawlessness, obsession with strange myths, and an almost impenetrable mindlessness.” The common person usually lived in a nameless village or hamlet, with no sense of location save some landmark such as a large tree or a stream. There were no maps available for them. If someone went off to a war or wandered away, they would likely not find their way back home. There were no watches or clocks or what we would recognize as a calendar, so there was no real sense of time save the passing of the day and the seasons. There was no news media to keep the people informed and aware of what was happening in the world around them. The “mindlessness” Manchester writes of is an almost total absence of a sense of “self.” People for the most part harbored no personal hopes and dreams. The ego which we today are so familiar with was minimal then. Before Rome fell, it spread Christianity over much of Europe but few people really understood the new faith. Consequently, during the Dark Ages paganism remained dominant and actually influenced the Christianity of the day. Some churches were even built where pagan temples once stood. But the Church was not without its power and purpose. Despite their lack of understanding, many people looked to the Church for a sense of stability and order during chaotic times. Thus the stage is set for The Shattering, the onslaught of change carried by the Renaissance and the Reformation. This is the longest section of Manchester’s book and because I don’t want anyone’s eyes to permanently cross or have anyone fall asleep, I’ll continue this review in Part 2. Because it is so long, I’ll try to draw more of sketch rather than present a detailed photograph of the events that follow. These events which we often forget or ignore in these high-tech times are still shaping who we are now and will continue to influence us in the decades ahead. It is important for all of us to understand them and I hope you will join me again in Part 2.